Posted November 20, 2017 by laurielmorrison & filed under Author Interviews, The Writing Process, Young Adult Literature. With Thanksgiving a few days away, today feels like the perfect time to post an interview with an author and friend I am very, very grateful for: Cordelia Jensen. Cordelia and I were classmates at Vermont College of Fine Arts, and I am incredibly lucky to have her in my writing life…and in the rest of my life, too! She and I co-wrote our forthcoming middle grade debut, Every Shiny Thing, which alternates between prose and verse sections, and she’s also the author of two YA verse novels: Skyscraping, a 2016 ALA Best Book for Young Adults, and the The Way the Light Bends, which is due out from Penguin/Philomel Books on March 27, 2018. I admire Cordelia’s writing immensely; she is a true master of the verse novel. 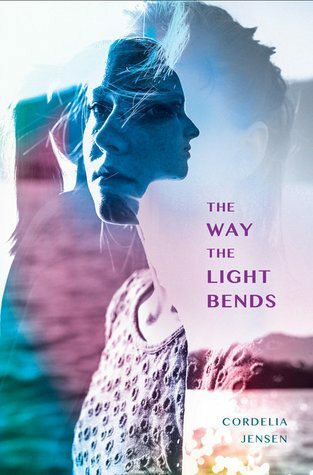 One thing that strikes me about all of Cordelia’s verse projects is how beautifully the format fits the character and story, and that feels especially true with her new book The Way the Light Bends. The Way the Light Bends is a gorgeous, unique, powerful story, and I cannot imagine the book being in any format but verse, so I’m excited that Cordelia was willing to answer my questions about her process of using verse for this special book. Virtual twins Linc and Holly were once extremely close. But while artistic, creative Linc is her parents’ daughter biologically, it’s smart, popular Holly, adopted from Ghana as a baby, who exemplifies the family’s high-achieving model of academic success. Linc is desperate to pursue photography, to find a place of belonging, and for her family to accept her for who she is, despite her surgeon mother’s constant disapproval and her growing distance from Holly. So when she comes up with a plan to use her photography interests and skills to do better in school–via a project based on Seneca Village, a long-gone village in the space that now holds Central Park, where all inhabitants, regardless of race, lived together harmoniously–Linc is excited and determined to prove that her differences are assets, that she has what it takes to make her mother proud. But when a long-buried family secret comes to light, Linc must decide whether her mother’s love is worth obtaining. I just know readers will ache for Linc, root for her, and remember her story long after finishing the book. Here’s what Cordelia had to say about why verse fit this novel so well. Laurie: Why did you choose to write The Way the Light Bends in verse? Cordelia: Because verse is a hybrid genre, a mix of story and poetry, it is a great choice for any character caught between worlds. The main character of The Way the Light Bends lives in a liminal space. Linc is an outsider in her family and in her school, and yet she has an intense and rich inner life. In the story, Linc learns to give external expression to this inner life. She eventually achieves congruence, but the verse itself allows readers, from the onset, to feel the disparity between what is around her versus what is in her head. Laurie: I love this point about how verse’s hybrid nature means it works well for a character who doesn’t quite fit in one place or another. So interesting! What did the verse format allow you to do that you wouldn’t have been able to do without it? Cordelia: One of my favorite parts about writing verse is the way you get to shape white space, like you are a sculptor of words. Because Linc is an artist, I decided to let her imaginative voice shine through in the words themselves. She plays with white space and line breaks more than any other character I have written. She also shows her artistic flair by using punctuation in unusual ways sometimes and also by using different fonts. In every moment while writing this story, I wondered how I could push the visual part of the poetry as I knew this would give the reader the best insight into Linc’s mind. Free verse is a great form for Linc because the verse itself allows (almost demands) a creative approach to seeing the world. 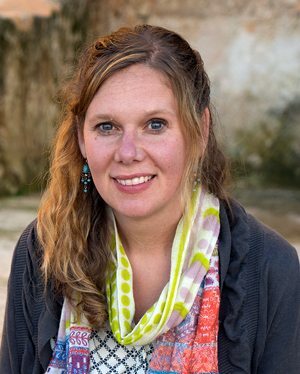 Laurie: I am always in awe of how visually creative you can be with your verse projects because that feels so different from the kind of creativity involved in writing prose. And I loved getting to experience Linc’s mindset through these visual aspects of her narrative. I am very different from Linc, and that really helped me understand her. What was the biggest challenge in using verse for this novel? Cordelia: When writing verse, one of the biggest challenges is adequately developing secondary characters. Because you have limited dialogue in verse, you have to make sure that the moments of interaction you show between your main character and other character are both poignant and subtle. Almost every secondary character in the book went through its own revision, trying to make him/her a more dimensional character. That is one of the many great parts about writing books with you, Laurie. Since you write in prose and I write in verse, your sections strengthen the secondary characters’ development in a way that is really hard to do in verse. A second challenge was that because I played with spacing so much, in the end I had to do quite a bit of cutting in order to fit the book into a standard page length. Laurie: The limited dialogue in verse (and limited word count in general) seems like a really hard thing to navigate, so I can see why it took many revisions to give this book all of the lovely dimensions it now has! And I love that writing half-prose/half-verse books together helps us manage the challenges of both forms. I can include dialogue-heavy sections that round out the secondary characters, but I often have a hard time moving from one scene to another within the same chapter, and you’re able to write poems that seamlessly jump from one time and place to another, since each one both drives the story forward but is also a self-contained poem-scene. Thanks so much for answering my questions, Cordelia! Fans of verse novels and/or gorgeously written stories about sisters, artists, the challenges of fitting into a high-pressure academic environment as a creative person, and New York City can add The Way the Light Bends on Goodreads and preorder it on IndieBound, Barnes & Noble, or Amazon. And if you want to check out Cordelia and my co-written book, Every Shiny Thing, that’s on Goodreads and available for preorder on IndieBound, Barnes & Noble, or Amazon, too! Great interview, Laurie. Cordelia, I love what you said about Linc living in liminal space. And I loved the version of the book that I read. I’m looking forward to seeing the final form! Love that cover! I love these thoughts on verse novels and look forward to reading The Way the Light Bends. Thanks for the great interview!